Discovery Arts serves more than 3,500 children and their families each year. All of our programs and services are offered free of charge to the hospitals, patients and their families. We rely completely on the generosity of individuals, corporations and foundations to fund our programs. The partnership opportunities outlined below allow us to reach more children undergoing treatment during the most critical time that a child and their parents will ever face. Partnership opportunities are unique and wholly dedicated to each participating hospital program. We currently have programs at Mattel Children's Hospital at UCLA, Millers Children’s Hospital Long Beach, Jonathan Jaques Children’s Cancer Center at Millers, CHOC Children’s (Children’s Hospital of Orange County), CHOC at Mission, Fountain Valley Regional Hospital & Medical Center, and Mercy Children’s Hospital in Springfield, Missouri. 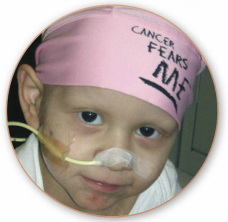 Children with cancer are frightened, confused, angry and withdrawn. Their emotional needs are great: they need a safe place to express their feelings; they need relief from the pain and chaos of critical illness; they desperately need fun and normalcy. These needs are largely unmet as the medical community must focus on the physical child while families struggle to cope emotionally and financially. Through our unique, creative Arts Adventures in music, art, dance and drama, our programs help meet an enormous need for critically ill children and their families. We bring a huge sigh of relief right to the center of the 'pressure cooker” of cancer treatment. Sadness and isolation are replaced with safety, friends and laughter, which positively impacts their recovery process. We are there to ensure that each child has the opportunity to forget about the obvious horror of cancer treatment or life-threatening illness and focus instead on having fun in an environment that is full of creativity, support, love and laughter. Your much-needed financial support will help us provide new Arts Adventures for children currently in treatment, grow our existing programs and continue to reach even more terminally ill children. It is our hope that you will join us in our mission to bring the magic of the arts to these critically ill and unfortunately often forgotten children. Download and save our Partnership Package by scrolling through the pages, or click on the bottom right tab to view in a HTML format.